“This is the place,” and joy seemed to fill all. But we are getting ahead of ourselves, let’s step back. In September 1850, Elder Charles C. Rich, one of the Church’s Twelve Apostles (the leading councils of the Church are the First Presidency and the Quorum of the Twelve Apostles), visited a group of Mormon gold miners who were working on the American River near Sacramento, California. Rich suggested to them that it would be well for them to spend the winter, when mining had to stop, on missions to the Sandwich Islands (Hawaiʻi) because expenses were smaller in Honolulu than they were in the gold fields of California. But, the weather, particularly the rainfall, had serious consequences – sometimes there was too much, most of the time there was too little. A spring was about 1-mile from where they lived and farmed. In later years, Pālāwai Basin was planted in pineapple. 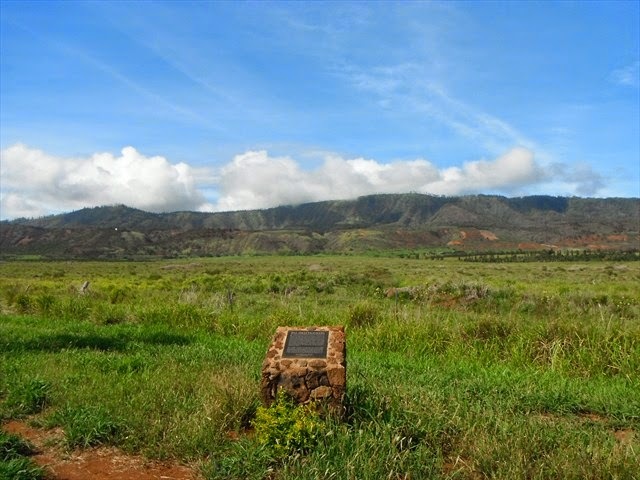 In 2004, the Mormon Pacific Historical Society and the Mormon Historic Sites Foundation erected a monument to the Pālāwai Saints paying tribute to those early members who established the first gathering place for Mormons in Hawaiʻi. The image shows the Mormon memorial, overlooking some of Pālāwai Basin. In addition, I have included other related images in a folder of like name in the Photos section on my Facebook and Google+ pages. The total land area of Lānaʻi is 89,305 acres, divided into 13 ahupua‘a (traditional land divisions.) In the traditional system, respective konohiki served as land managers over each. These konohiki were subject to control by the ruling chiefs. 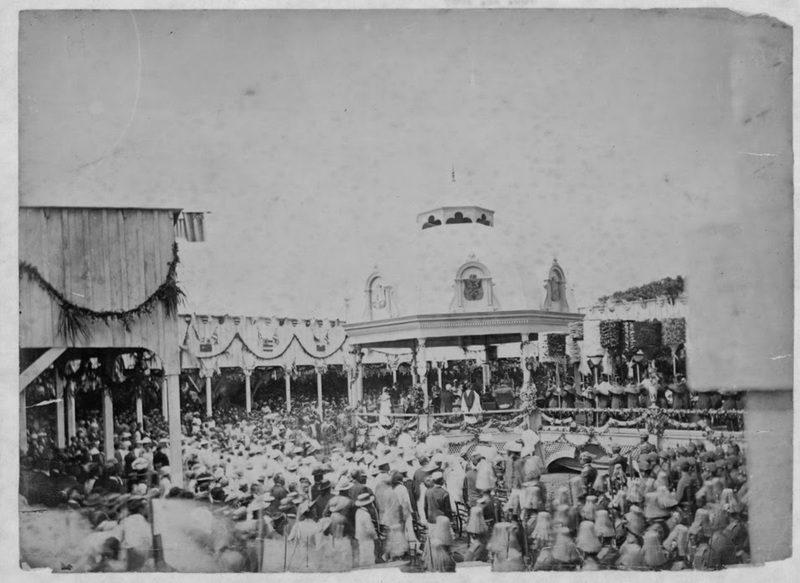 At the time of the Great Māhele (1848,) lands on Lānaʻi were divided between lands claimed by King Kamehameha III (Kauikeaouli) (40,665 acres,) which were known as the Crown Lands, and the lands to be claimed by the chiefs and people (48,640 acres,) which were called the Government Lands. When James Dole bought Lānaʻi, ranching was a thriving business under the control of George Munro. Shortly after the purchase, Dole got Munro working at removing cattle from potential pineapple lands. As soon as cattle were fattened they were sold. Ranching operations became a secondary priority to pineapple development. During 1923, the company embarked on making major improvements to the island of Lānaʻi. At first, Dole wanted to name the town Pine City, but the post office department objected because there were too many “pine” post offices in the mainland United States. So the plantation town was called Lānaʻi City. Mānele Bay was the main port of entry for Lānaʻi; its primary purpose was to ship pineapple off the island. On the eastern side of the island, remnants of Halepalaoa Landing can be seen; this was used primarily to ship cattle. It’s also reported that in the late 1800s, a steamer landing was located on the western shore of Lānaʻi Island and served as a docking grounds. A new harbor was needed. In 1923 to 1926, Kaumālapaʻu Bay, a natural, sheltered cove on the southwest side of Lānaʻi, was developed into the main shipping harbor from which pineapple and all major supplies for Lānaʻi were shipped and received. Bins filled with pineapple were unloaded from the trucks (steam cranes were still used through the 1960s), and placed on the barges for shipping to the cannery at Iwilei, Honolulu, Oʻahu. Tug boats were used to haul the barges – empty bins and supplies to Lānaʻi, and filled pineapple bins to the cannery. Access to fishing, whether by boat or off the shoreline, is easily attained at Kaumālapaʻu. One of the sites immediately mauka of the harbor is called “Fisherman’s Trail.” In the 1862 letter requesting settlement and use of Lānaʻi, even Gibson indicated the importance of fishing as the primary source of subsistence for the island’s inhabitants. In the Māhele, the ahupuaʻa of Kamoku and Kalulu (which adjoin the existing Kaumālapaʻu Harbor) were retained by the King (Kamehameha III), though the ‘ili of Kaumālapaʻu 1 & 2 were given by the King to the Government. Today, as in the early 1920s, Kaumālapaʻu Harbor is the main commercial seaport and Lānaʻi’s lifeline to the outside world, with weekly Young Brothers’ barge and other commercial activity in and out of Lānaʻi. 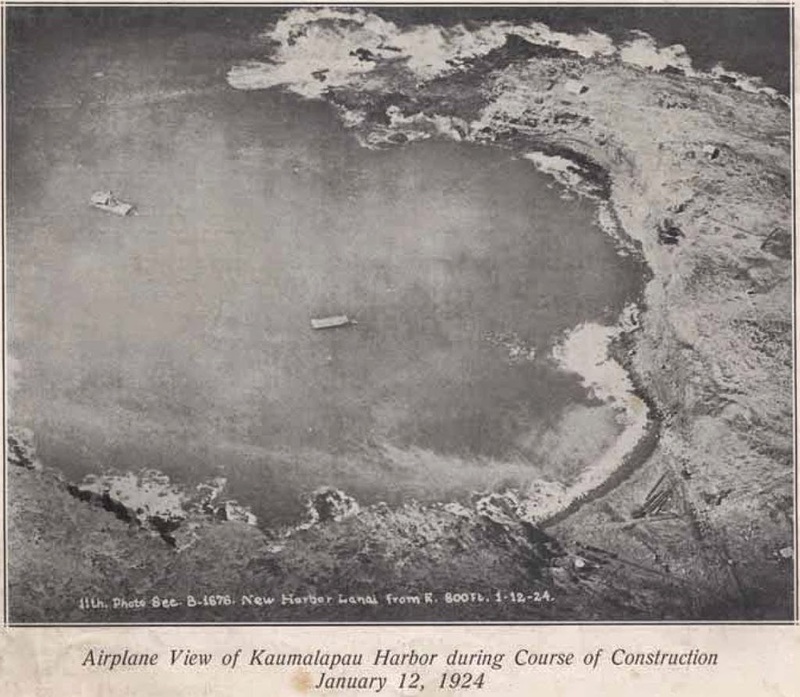 The image shows initial construction of the Kaumālapaʻu facilities (1924) (Lanai-PineappleKingdom.) In addition, I have added other related images in a folder of like name in the Photos section on my Facebook and Google+ pages. In ancient times, the windward coast of the island of Lānaʻi was home to many native residents. Maunalei Valley had the only perennial stream on the island and a system of loʻi kalo (taro pond field terraces) supplied taro to the surrounding community. In 1861, Walter Murray Gibson came to Hawaiʻi after joining the Mormon Church the year before; he was to serve as a missionary and envoy of the Mormon Church to the peoples of the Pacific. He landed in Lānaʻi and eventually created the title “Chief President of the Church of Jesus Christ of Latter-day Saints in the Islands of the Sea.” He more regularly went by the name Kipikona. By the 1870s, Gibson focused his interests in ranching in the area called Koele, situated in a sheltered valley in the uplands of Kamoku Ahupuaʻa. As the ranch operation was developed, Koele was transformed from an area of traditional residency and sustainable agriculture to the ranch headquarters. (Lānaʻi Culture and Heritage Center) In 1872, Gibson moved from Lānaʻi to Lāhainā and then to Honolulu. After Gibson’s death in 1888, the ranch was turned over to his daughter and son-in-law, Talula and Frederick Hayselden. As early as 1896, the Gibson-Hayselden interests on Lānaʻi, which held nearly all the land on the island in fee-simple or leasehold title, began developing a scheme to plant and grow sugar on Lānaʻi. They developed larger support communities along the coast, cleared the lands, developed a narrow gauge railroad between Keōmoku Village and Kahalepalaoa (where the boat landing was situated,) and planted sugar cane, irrigated by water from Maunalei Valley. Both men and women were brought from Japan, and a finder’s fee of $27- $36 per male employee, and $23 – $30 per female employee was paid to the immigration companies. Laborers were typically paid around $0.70 to $0.75 per day, with expenses for merchandise and board deducted from pay at the end of the month. All did not go as planned. Before completing the construction of the mill and associated facilities, and prior to the first harvest being collected for processing, the Maunalei Sugar Company went bankrupt. Sugar is a thirsty crop and the necessary water resources for the plantation were never realized. Plantation records during the three year period of the plantation’s operation, some 70 employees (most of Japanese origin) died and were buried on Lānaʻi. In 1932, members of the Lānaʻi Hongwanji Mission built a memorial for Japanese employees of the sugar plantation near the grave sites. Some other unfortunate consequences resulted from the Lānaʻi sugar endeavor. A part of the plantation’s work resulted in the introduction of the algarroba (kiawe) tree – the hardwood was to have been used as fuel for the furnaces, and the seeds as feed for the livestock. Left untended, the trees became an invasive pest on the island. The image shows a map of Maunalei Sugar (Lanai Culture and Heritage Center.) Here is a link to more images. There’s a small island between Hulopo’e and Mānele off the southern coast. There is a tradition of how this place, and particularly the little island, came to be called Pu‘upehe, that was first recorded in 1867 by Walter M. Gibson, then owner of large portions of Lānaʻi, who reportedly learned the account from the chief, Pi‘ianai‘a, who was on Lānaʻi with Kamehameha I.
Gibson published the account under the title of “The Tomb of Puʻupehe, A Legend of Lānaʻi,” in the island newspaper, the Hawaiian Gazette of March 3, 1867. 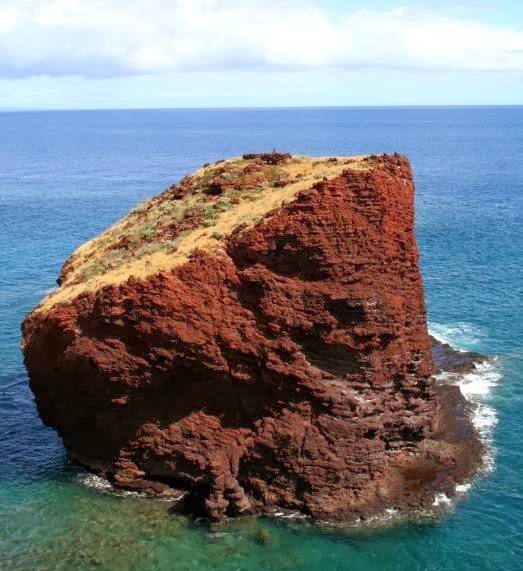 Observed from the overhanging bluff that overlooks Puʻupehe, upon the summit of this block or elevated islet, would be noticed a small platform formed by a low stone wall. This is said to be the last resting-place of a Hawaiian girl whose body was buried there by her lover Makakēhau, a warrior of Lānaʻi. Puʻupehe was the daughter of Uaua, a petty chief, one of the dependents of the king of Maui, and she was won by young Makakēhau as the joint prize of love and war. These two are described in the Kanikau, or Lamentation, of Puʻupehe, as mutually captive, the one to the other. The maiden was a sweet flower of Hawaiian beauty. Her glossy brown, spotless body “shone like the clear sun rising out of Haleakala.” Her flowing, curly hair, bound by a wreath of lehua blossoms, streamed forth as she ran “like the surf crests scudding before the wind.” And the starry eyes of the beautiful daughter of Uaua blinded the young warrior, so that he was called Makakēhau, or Misty Eyes. Makakēhau left his love one day in the cave of Malauea while he went to the mountain spring to fill the water-gourds with sweet water. This cavern yawns at the base of the overhanging bluff that overtops the rock of Puʻupehe. The sea surges far within, but there is an inner space which the expert swimmer can reach, and where Puʻupehe had often rested and baked the honu or sea turtle, for her absent lover. This was the season for the kona, the terrific storm that comes up from the equator and hurls the ocean in increased volume upon the southern shores of the Hawaiian Islands. Makakēhau beheld from the rock springs of Pulou the vanguard of a great kona,—scuds of rain and thick mist, rushing with a howling wind, across the valley of Palawai. He knew the storm would fill the cave with the sea and kill his love. He flung aside his calabashes of water and ran down the steep, then across the great valley and beyond its rim he rushed, through the bufferings of the storm, with an agonized heart, down the hill slope to the shore. The sea was up indeed. The yeasty foam of mad surging waves whitened the shore. The thundering buffet of the charging billows chorused with the howl of the tempest. Ah! where should Misty Eyes find his love in this blinding storm? A rushing mountain of sea filled the mouth of Malauea, and the pent-up air hurled back the invading torrent with bubbling roar, blowing forth great streams of spray. This was a war of matter, a battle of the elements to thrill with pleasure the hearts of strong men. But with one’s love in the seething gulf of the whirlpool, what would be to him the sublime cataract? What, to see amid the boiling foam the upturned face, and the dear, tender body of one’s own and only poor dear love, all mangled? You might agonize on the brink; but Makakēhau sprang into the dreadful pool and snatched his murdered bride from the jaws of an ocean grave. The next day, fishermen heard the lamentation of Makakēhau, and the women of the valley came down and wailed over Puʻupehe. They wrapped her in bright new kapa. They placed upon her garlands of the fragrant na-u (gardenia). They prepared her for burial, and were about to place her in the burial ground of Manele, but Makakēhau prayed that he might be left alone one night more with his lost love. And he was left as he desired. The next day no corpse nor weeping lover were to be found, till after some search Makakēhau was seen at work piling up stones on the top of the lone sea tower. The wondering people of Lānaʻi looked on from the neighboring bluff, and some sailed around the base of the columnar rock in their canoes, still wondering, because they could see no way for him to ascend, for every face of the rock is perpendicular or overhanging. The old belief was, that some akua, kanekoa, or keawe-mauhili (deities), came at the cry of Makakēhau and helped him with the dead girl to the top. “Where are you O Puʻupehe? Are you in the cave of Malauea? The water of the mountain? The pala, and the ohelo? And the red sweet hala? Shall I pound the kalo of Maui? Shall we dip in the gourd together? And the mountain water is sour. The image shows Puʻupehe In addition, I have added other images in a folder of like name in the Photos section on my Facebook and Google+ pages.